If it were January, I'd be making some New Year's resolutions. Work less. Pay more attention to the kids. Stop multitasking. Breathe. Exercise. Cook dinner. Blog more! But it's June. I can't work less or important things won't get done. My kids are busy themselves, thank goodness, too busy to realize just how distracted I've been. Multitasking feels essential. I'm breathing and occasionally exercising. Cooking dinner? A few times a week, better than nothing. But hey, at least I'm here writing this post. On Memorial Day, for the first time in months, we had friends over for dinner. I made pulled pork and (of course) served it with a Not Ketchup bar. Guess what? All four flavors taste great when mixed with slow-cooked shredded pork shoulder. My favorite for pulled pork is Cherry Chipotle Not Ketchup, with Spiced Fig Not Ketchup a close second. Blueberry Not Ketchup always has its fans. And Smoky Date Not Ketchup is a good all-around choice too, especially for kids who might not like the spices in the other flavors. The next day I mixed the leftover pulled pork with shredded Mexican blend cheese and rolled it up in flour tortillas, then baked them until crispy. It was one of those forehead-smacking moments: Why haven't I ever thought to do this before? They were tasty and so much fun to eat - especially when we dipped them into guacamole and more Not Ketchup. Of course, you can put just about anything inside a tortilla and roll it up. Beans, cooked vegetables, leftover rice, chopped rotisserie chicken. Just mix it with some shredded cheese before rolling and baking. And serve a delicious dip on the side. 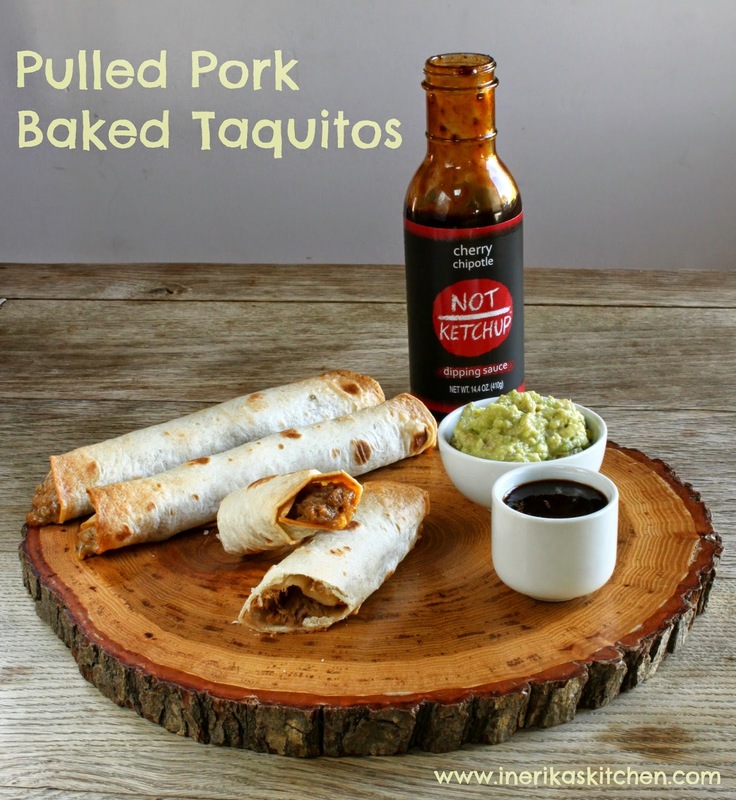 Mix pulled pork with shredded cheese, roll it up in flour tortillas, and bake in the oven until crispy. Serve with a fun dip on the side, like guacamole, salsa, or Cherry Chipotle Not Ketchup sauce. Preheat the oven to 375 degrees F. Line a baking sheet with aluminum foil, then spray the foil lightly with cooking spray.In a medium-sized mixing bowl, blend the pulled pork with the shredded cheese with a large spoon.Lay one tortilla on a cutting board and spoon about 1/4 cup of the filling lengthwise on the bottom third of the tortilla. Roll the tortilla up tightly around the filling. Lay the taquito on the baking sheet, seam side down. Repeat with the remaining tortillas and filling.Bake the taquitos until golden brown and crisp, 10-15 minutes. Serve immediately with guacamole and Cherry Chipotle Not Ketchup on the side. Hope you had a great trip to Texas! These sound terrific! @Suki I know we enjoyed them - and no doubt will again soon. :) @Christy thanks, just got home. The trip was a huge success!